With maps, tokens, adventure information, and instant communication, this reimagining of a classic comes to life with roll20, an online engine that gives players and DMs the tools they need to get into one of the best adventures to date. In recognition of the growing power of the internet to facilitate roleplay, Wizards of the Coast has teamed up with Roll20, the biggest online games provider, to deliver official adventure packs to provide the full experience of tabletop with many (though not all) of the benefits of technology. I have long held the opinion that merging these two mediums can be a wonderful mix, and I am glad to have gotten a hands on experience with the Tomb of Annihilation to see how Roll20 managed to take this adventure into cyberspace, and help Dungeon Masters around the globe share it with their groups. I have not gotten a chance to finish Tomb of Annihilation, but having read through it, I can speak to its themes, power levels, and main features. While still in the Forgotten Realms, we have finally moved out of the Sword Coast and into the wild jungles of Chult, a dark continent stirring with rumor and treachery. Souls meant to venture to the afterlife are instead disappearing. Undead beings are evaporating off of the face of the globe. Is this the wrath of some god or the sinister plot of a darker deity? Penned with consultation by Adventure Time’s own Pendelton Ward, this adventure mixes horror and humor in rare form, to create an adventure that is easily one of Fifth Editions best so far. For those of you still unfamiliar, Roll20 is an online platform for hosting and running roleplaying games. Its massive player base alone makes it a boon to In next to no time you can be dropping monsters down, manipulating maps and lighting, and even creating your own resources for other players to use in their home games. players and GMs of all sorts. Although its metrics skew HEAVILY towards D&D and Pathfinder variants, that mostly stems from their market dominance in general, and not overrepresentation on the site. Roll20’s interface contains integrated character sheets for you to share, an online dice roller (to keep everyone honest) as well as map and token integration to simulate the tabletop. You can easily find maps and put them straight onto the virtual table for every player to see. With the paid subscription you can add dynamic lighting, which hides portions of maps from players until they enter the area. As their tokens wend around corners, the shadow slowly angles away from them, revealing more of the room. I have had more than a few moments of terror when approaching a chamber with only part of it revealed. There, up ahead, I could see a white leg sticking out. Was it a body or a skeleton? The barest hint of a dragon’s claw, or something more sinister still? Additionally, there are several trackers on the site to help keep things moving. Each token has health and ammunition, as well as symbols for various status effects. There is an in built initiative tracker visible to all. Not visible to everyone are secret GM notes that you can send to individual players and hide from others. As a basis, Roll20 has everything you need to get your game up and running. There are a few drawbacks, however, that keep Roll20 from being a perfect product. Many token and map packs, along with the dynamic lighting, are paid, which may deter some from using the site. However, the VAST majority of material is free. While Roll20 does have a voice chat feature, its quality is rarely consistent, and a pretty universal rule of thumb is to switch it out for Discord or Skype. All sessions I have participated in either opted for that substitution initially or did so in short order. On the plus side, all of its features are refreshingly user friendly. Not only are the staff advice and user forums populated with great help, but even the more complex tasks are incredibly intuitive. In next to no time you can be dropping monsters down, manipulating maps and lighting, and even creating your own resources for other players to use in their home games. All this talk of maps and monster tokens brings up an important point that will affect your mileage with Roll20: it is built first and foremost for miniature gameplay. For Dungeons and Dragons, where a visual grid is often necessary, Roll20 makes your day. My Vampire the Requiem game, however, has little use for it that you could not get out of Discord or Skype. Tomb of Annihilation for Roll20 costs a full $50, which is no small sum. However, the length of the adventure and amount of content it contains makes that purchase well worth considering. It not only cuts down on prep time immensely and makes lookup a breeze, but it comes prepacked with everything you need to get up and running with Tomb of Annihilation…almost. Launching into my copy of the module, I was pleasantly whelmed with the bevy of tools at my fingertips. Laid out in order of the book itself, it had all of the information I needed. It had searchable lists of powers, monsters, items, and more. Each book reference contains a link that you can pull out into a separate window and modify at will if you so choose. You can even change the order of the book if it helps with notekeeping. Tomb of Annihilation (or ToA) sets itself apart right off the bat, giving you a ticking clock (of sorts) and a goal to spur you onwards: death and undeath simply no longer work as they should. Many of the attachments function as player aids that you can show them when discovered. As they enter a new city, you can give your players a map. When they stumble upon their first dungeon, its entryway will flash up on their screens. After they uncover a scroll hidden within the ribcage of a zombified servitor, you can send it straight to them, still dripping with viscera. For the players, they only see a closed door. The Dungeon Master, on the other hand, is fully prepared for the nasty surprise that awaits within. The module comes preloaded with the text of the adventure, but also all of its maps for the players to explore. These maps are already full of the relevant monster tokens, although you will have to go to the appropriate sidebar to find their stats. Easy enough, but that one step could be eliminated. The dungeons also have reference points to their counterparts in the text for you to easily look up what they find in each location. Again, you have to make this search yourself rather than it being integrated directly into the map, which I hope will be a feature of future releases. Edit: I have since learned that you can hold shift and double click on a token to automatically pull up its stats/character page. This is a wonderful inclusion, and I blame my not knowing about it on my own limited experience with Roll20, not any unintuitive interface. Because the monster and dungeon statistics exist on their own, much of the housekeeping is still left up to the Dungeon Master to do beforehand and during. This inimical aspect of game running might yet persist unto eternity, but I see Roll20 as the perfect way to start cutting down on it. While we are aaaaaalllmost there, and I can sense the software engineers doing their level best to get us there, we remain merely on the precipice of a great becoming, looking down on the freeform adventures that one day might rule the land. Tomb of Annihilation is one of the highest quality experiences Wizards has released to date. We have spent far too long on the bog-standard fantasy setting of the Sword Coast. Even Faerun itself has more interesting areas, such as the Islamic Golden Age inspired Al-Qadim. While it may not be the Planescape or Many moments in ToA are hilarious, but they complement the awful implications of what you are seeing rather than detracting from it. Dark Sun we are all hoping for, the new adventure makes the intelligent decision to venture into one of the more exotic locales of Faerun. With the rules of the world turning topsy-turvy, you and your band of travelers find themselves in Chult, a lush and verdant jungle that hides within its forests a secret that will shock the laws of nature themselves. Tomb of Annihilation (or ToA) sets itself apart right off the bat, giving you a ticking clock (of sorts) and a goal to spur you onwards: death and undeath simply no longer work as they should. Souls bound for the afterlife, reincarnation, or resurrection instead go missing. Undead creatures, whether they be good, evil, or otherwise, lose one point off of their maximum hit points per day. This disturbing mystery at your backs, you send your players into the dark to find its source. Not only is Chult full of the mystical tribes and dark rituals you would expect (which, yeah, I can admit feels a little racist, especially with all the vaguely-African made up names in there) it has dinosaurs. Dinosaurs and undead. You know what that means don’t you? DON’T YOU?! Zombie dinosaurs. And some of them can be your friends. Despite the stereotypical nature of some of this adventure, the deeper you delve into Chult the more you find how developed and alive this place really is. It’s like reading Conrad except a third of the way through Chinua Achebe started coauthoring. (Ha. That reference comes straight from the tenth grade, so I can veil my work in transparent pretension.) There are multiple factions at play which are already trying to deal with the problem, as well as their own internal strife. 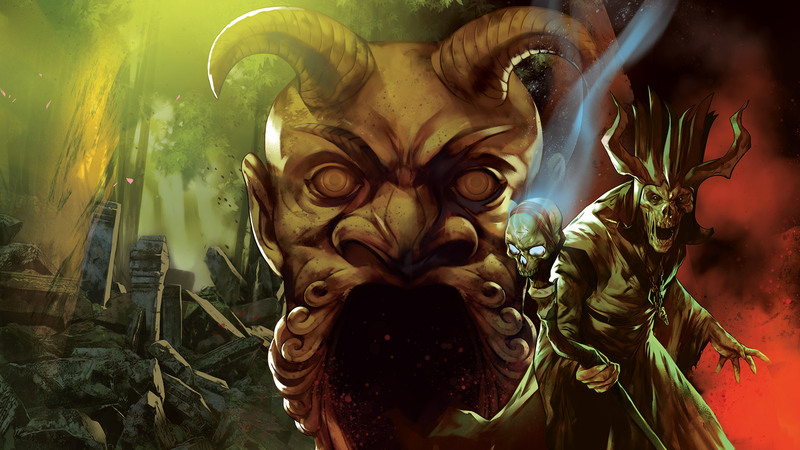 While most adventures start you with an inauspicious beginning that slowly ramps up, Tomb of Annihilation gives you a time limit right at the start. Your friend and quest-giver is living with a death sentence because of the strange magics afflicting the earth. Even though Chult is littered with side quests and areas to explore, you have to ask whether these tantalizing chances for more lore (and loot, of course) are worth straying from your path. 79 days is a lot of time, but there is much to explore and consequences for failure. Acerak, the demi-lich who dwells far below the Tomb of Horrors, is of course a part of the adventure, and a major portion of its marketing material. As much as I like the character, I wish they downplayed him before ToA’s release. As soon as you hear that something is changing the rules of death, it becomes pretty clear that he is involved. Trying to suggest to your players that something else is afoot will result in eye rolls unless, by good fortune, they have never heard of Acerak, ignored the marketing materials, and not seen the cover of the book. Even that is only a limited flaw, however. The slow process of discovering what he has done, how, why, its impacts, and the implications of stopping it (or failure to do so) make for an adventure that I can truly call epic in scope and horror. Despite the humor that permeates the Tomb of Annihilation, its ultimate conclusions will shake your characters to their cores. Along the way, you will encounter a dizzying variety of locations and themes without sacrificing a core feeling. Many moments in ToA are hilarious, but they complement the awful implications of what you are seeing rather than detracting from it. The jungle yields many secrets and area types, despite how uniform you might have expected the area to be. The final dungeon will be a true challenge for your players, having risen from level 1 to around 10. Its monsters and puzzles will more than likely take a few of them down, but until that point they will certainly enjoy the ride. For those looking for an extra challenge, you can play using the Meatgrinder Rules, which among other things raise death saving throw DCs to 15. In terms of additional options, you will be found wanting unless you look in the right places. There are no new subclasses and few races for you to play as, but as far as I am concerned this is no flaw. Fifth edition knows not to overwhelm us with content (lest it die the slow death of 3.5). Rather, it gives us new ways to play. The jungle contains dehydration rules, dinosaur races, an optional loyalty system, and a few special bonuses I will let you discover on your own. Those, along with the extra difficulty options, are easily enough to keep me satisfied. One of the best 5e adventures to date sees itself brought to unlife on Roll20 with flair and class. The few hiccups along the way won’t distract you once you start cutting through the jungles of Chult and find just how much there is to find within. Mixing humor, brilliant design, unforgettable characters, and a uniquely world-shaking plot, Tomb of Annihilation is every bit worth delving into. But seriously, is this racist?